Christendom College is celebrating its 42nd year of preparing its students for their roles in re-Christianizing the temporal order. By getting into a wide variety of fields, alumni are better able to influence the culture around them to become more Christo-centric. The number of fields impacted by Christendom alumni since 1977 is staggering: the medical field, politics, law, military, entertainment, academia, law enforcement, business, and many more. The college has no plans for that to change, and wants to only increase the diversity of those fields. To that end, the college’s new career development director will be working closely with all of the students, and implementing some new plans and initiatives to ensure they are well-prepared for success post-graduation. Kristin Stephens began her role as the director of career development this July, after years spent in similar positions in the higher education field. 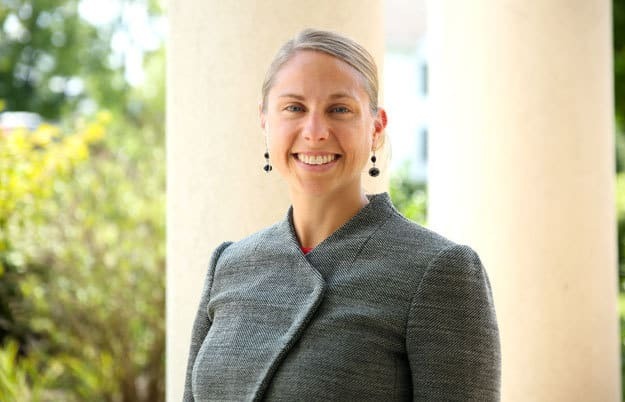 She holds a bachelor of arts in psychology from Roanoke College and a master of science in counseling and student affairs from Radford University. In addition to her experience in career services and residence life at Shenandoah University and James Madison University, respectively, Stephens has taught classes on a variety of subjects, including leadership, study skills, resume writing, and etiquette. She is more than ready to take on the role, and will be a boon to Christendom students. This year, Stephens will be working on a number of initiatives to help students. She plans on meeting individually with all freshmen and seniors to provide guidance, support, and inspiration as they determine and prepare for a career after Christendom. Students will also have the opportunity to attend a “professionalism for life” workshop where they will learn how to present themselves appropriately as college students and growing young professionals. Stephens will work to develop relationships with local businesses and employers in order to connect qualified students with jobs and internships, and will match students with alumni mentors when appropriate. She has created a special 4-year plan for all incoming freshmen, and has been working with some state-of-the-art software to help students understand themselves and their goals better. She will continue to work with the college’s alumni by having them speak on campus at the popular Life on Tap events. Already for the fall, a variety of alumni are scheduled to speak on such diverse career fields as entrepreneurship and business, finance and accounting, teaching and education, and the always popular field of medicine. Stephens will also assist students in choosing and applying to graduate school programs, working alongside the faculty to ensure that the students have the best chance of success. Alongside the efforts that are offered by the career development office, Christendom students also have the unique privilege of attending specialized career-oriented classes that are part of the core curriculum. In the classroom, freshmen through seniors are thoroughly educated in all that they need to know to prepare for job interviews, write resumes and cover letters, create budgets, understand their personality type and how it can influence their career choice, become proficient in research skills along with Excel and Powerpoint, create LinkedIn profiles and ask for references, and much more. Christendom students have every opportunity to not only get a job post-graduation, but to get into a great career field and excel beyond their peers – due in a large part to the time-tested, Catholic liberal arts education they have received. To learn more about the specific learning objectives of the Education for a Lifetime Program, go here. Students will not lack opportunities to prepare for their future during the academic year. Whether it’s writing a resume, networking with successful alumni, or just figuring out how to turn their dreams into reality, the career development office will be there to assist them every step of the way.